Azure Pipelines has been interesting to me especially given the generous free open source tier and seemingly instant availability of build agents. The setup is especially easy if you’re building .NET targets with lots of useful starters available. A couple of areas have, however, been frustrating however - build variables and the difficulty in getting the app installed and the limitations on triggers if you can’t (non-GitHub apps can’t be installed on Enterprise accounts even if FREE). We’ll concentrating on the build variable oddities for this post. The Pipeline configuration helpfully has a tab named Variables that looks much like you’d expect with a big list of names, values, a lock icon and a checkbox for ‘Settable at queue time’. There are however some oddities when compared to existing CI servers with these especially if you expect to be able to use them as environment variables. The documentation for these - especially for Predefined build variables shows the expected variables but they use a dot naming convention. One even more confusing element is that when you mark you own (sensibly named) value as secret it suddenly stops being available as a environment variable. Note: You should never build PRs with secret variables. Doing so allows anyone to submit a PR that simply echos them to the build log for harvesting. 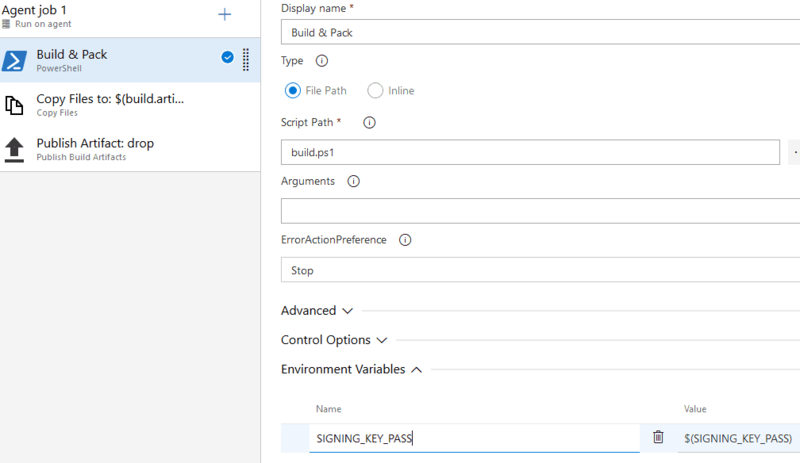 By default secrets are not available to pull requests in Azure Pipelines - leave it that way! If I figure out workarounds for the app installations I’ll blog them!